Special Counsel Robert Mueller’s report is in, but the Democrats aren’t dancing with Jim Acosta in the streets. Clearly, they don’t believe their own spin. After almost two years of daily conspiracy theory updates from cable news and stern-faced Democrats leading on their supporters in the belief that Mueller was going to magically overturn the 2016 election, not one shred of evidence points to the Trump campaign “colluding” with the Russian government in any way. In his letter documenting Mueller’s principal findings, Attorney General Bill Barr revealed that the Special Counsel had found no evidence of collusion, and determined that there was no basis for charging the President with obstruction of justice, either. “The Special Counsel did not find that the Trump campaign, or anyone associated with it, conspired or coordinated with the Russian government in these efforts, despite multiple offers from Russian-affiliated individuals to assist the Trump campaign,” Barr’s letter concluded. If there was even a remote possibility that the final Mueller Report might change that conclusion, Democratic politicians and their co-conspirators in the liberal media would be downright giddy with anticipation — which they are decidedly not. Supporters of the President, on the other hand, can’t wait for the big moment when the whole thing unravels for the Russiagate conspiracy theorists once and for all. It’s going to be marvelous. That’s why we’re eager to see the full report, which even Democrats and liberal journalists are all but admitting will show no collusion. President Trump, his family, and his advisors have been forced to listen as cable news talking heads and grandstanding Democrats smeared them with ridiculous speculation on a daily basis for 22 straight months. They and the rest of the Republican Party are just as eager as we “deplorables” are to finally get the truth out there. On Wednesday, President Trump himself reiterated that he doesn’t mind the Mueller Report going public. When Nancy Pelosi submitted a meaningless, non-binding resolution calling for the public release of the full Mueller report for a vote in Congress, not a single House Republican opposed the measure, and President Trump later confirmed that he’d urged his Party to go along with it. The resolution was clearly just a ploy to goad Republicans into looking as though they desperately wanted to keep the report under wraps, but not one Republican took the bait. Naturally, the liberal media ran with their pre-written narrative anyway, flooding the zone with stories about how President Trump was just pretending to want the report to be made public. In reality, the only people who seem “stressed” or “bothered” by news of the impending release of Mueller’s report are Democrats and liberal journalists, who will soon face the unenviable task of keeping the “Russiagate” narrative alive without a Special Counsel investigation to give it the veneer of credibility. Democrats, the mainstream media, and the droves of emotionally invested collusion truthers around the country simply have too much invested in this to let it go. That’s why they need to do anything they can to lower their supporters’ expectations before it’s all revealed to be an unsupported fantasy. 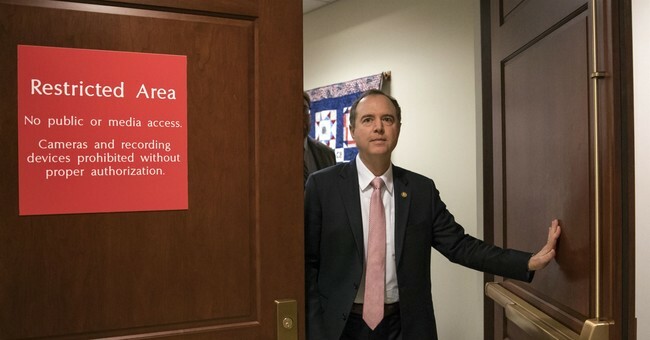 Part of that strategy involves congressional Democrats such as House Intelligence Committee Chairman Adam Schiff and House Judiciary Committee Chairman Jerry Nadler, both of whom are hard at work trying to move the goalposts to cover for the collapse of Russiagate by launching investigatory fishing expeditions in a last-gasp effort to find something — anything — they can use to attack Trump. The media also have a role to play. While Schiff and Nadler cast their nets wider, liberal reporters are responsible for keeping up an illusion of impropriety, framing each development as though Mueller really did find collusion and his findings are somehow being covered up. They can’t change the facts, though. The Mueller Report is in, and Russiagaters have been left holding the bag. Their obvious anxiety suggests that they know exactly what’s in that bag: nothing.